These cotton/poly bloomers complete every baby girl's outfit! 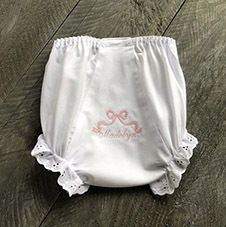 Personalize these bloomers with your choice of thread color and name or initial(s). Each bloomer is wrapped in tulle and white satin ribbon.